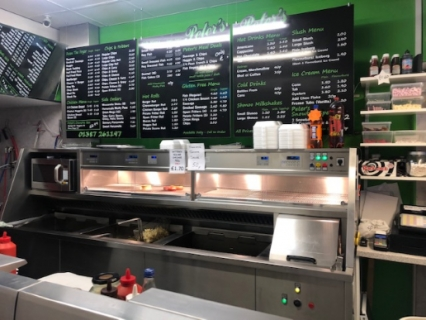 Central Business Sales is delighted to offer to the market a rare opportunity to purchase a well established and highly profitable traditional fish and chip shop. The business is located within a large steeple in the heart of Dumfries town centre. The takeaway benefits from a strong local trade and a high passing trade. It also benefits from the many events that take place in the town centre as the business is just yards from the main stage where everyone gathers. The takeaway offers a traditional fish and chip shop menu for takeaway and delivery. There is potential to expand the delivery side of the business and to also add an online ordering facility, such as Just Eat. There is potential to add to the current menu as well as expanding the opening hours as the business can open until 11pm if desired. The business can be run by one of the senior members of staff and this could offer a great investment opportunity. Alternatively, a hands-on owner operator could prove very successful. The unit is located within a unique steeple and attracts a high volume of tourists. The unit is approximately 37m², spread over 3 floors. The main serving and preparation area is on the ground floor. The basement offers fridge/freezer space and the first floor is ideal for storage. All the equipment, fixtures and fittings are included in the sale. The business is being offered on a leasehold basis with 3 years left on the current lease and a minimum of a 5 year extension available. The rent is £11,500 per annum 100% rates relief applies under the Small Business Bonus Scheme. The takeaway is run by the owners and 3 members of staff.